While in Germany last week I got to go to a company Christmas party. However, I missed our company Holiday party here which was also last week. The party was held in the Jena Volkshaus or People’s House. The large hall we were in is used for concerts and other events. It is also the home of the Jeaner Philharmonie orchestra. In this picture you see a small orchestra. This orchestra is composed of company employees. They had a great sound and played a lot of traditional holiday music. The Jena Volkshaus was opened in 1903 and was built by the Carl Zeiss Foundation. You can see that there is a lot of pink in the picture above. This is from the lights in the room. It was very difficult to get good pictures as they all had a pink hue to them. 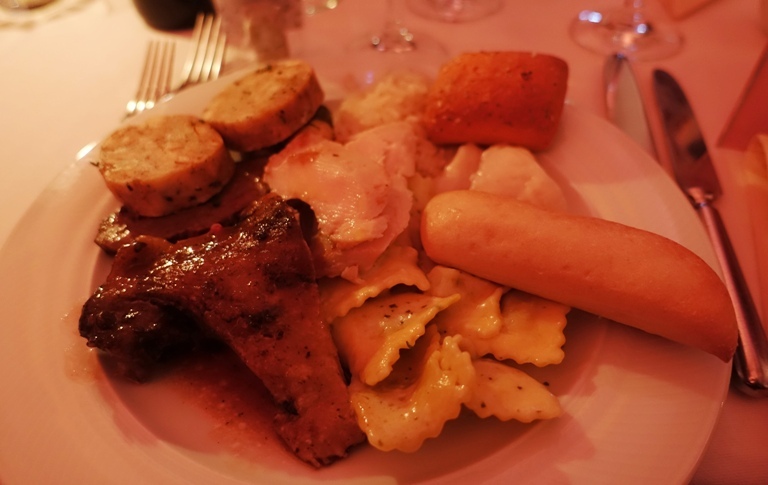 We had a really nice dinner buffet with good hearty food. 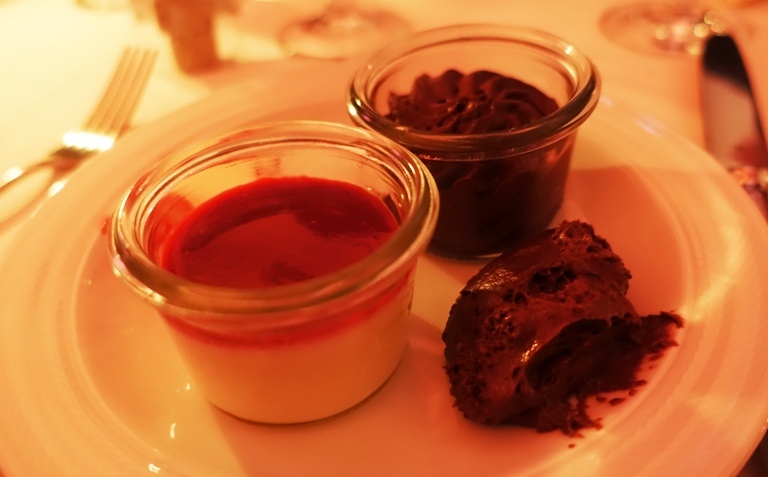 I did not get a good picture of the appetizer/salad plate, but here we have some of the dinner items. More wonderful than the food was a chance to hang out with my colleagues away from the office. I also wandered around and talked to other employees I have met through the 25 years I have worked for Zeiss. Some were very surprised to see me as they did not know I was visiting. 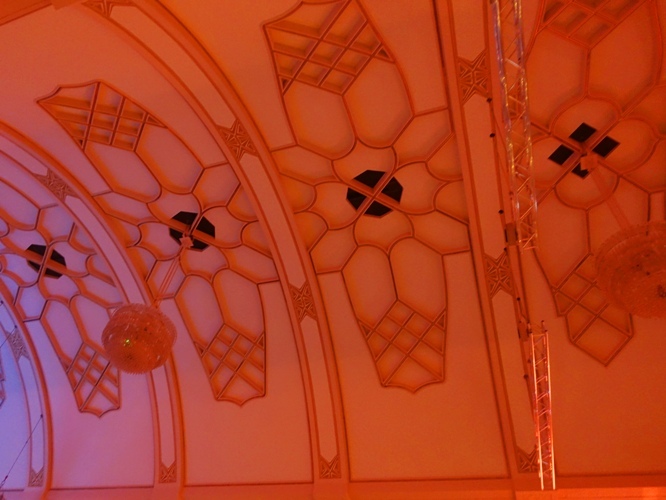 The ceiling of the hall had some very interesting geometrical designs. I just had to try and get a good picture of them. Again, you can see that pink hue from the lights. 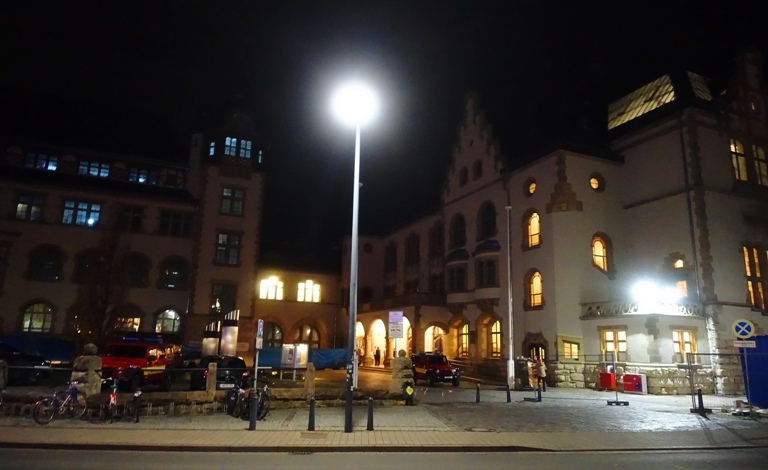 I thought about digging into my archive and finding a good picture of the outside of the Volkshaus, but decided that this picture that I took better conveyed what it was like that night. I took this picture just after leaving the party. It was a clear, cold evening. I then consulted the transit app on my phone to find the best place to catch the tram back to the hotel. 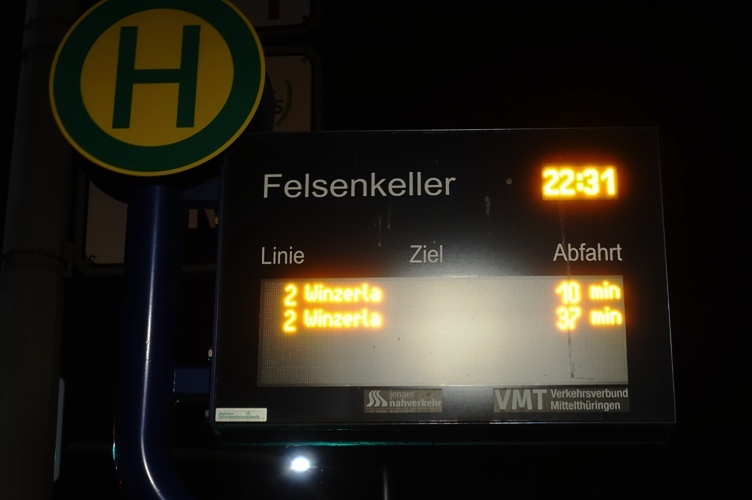 I had to make the choice between walking to a station that was close and waiting in the cold for half an hour or walking to one further away and having a shorter wait. I chose the second option and still had a long wait. However, the walk warmed me up just enough for the wait. The party was nice and I am glad that I was able to be there. However, I did miss getting to go to the party at home. 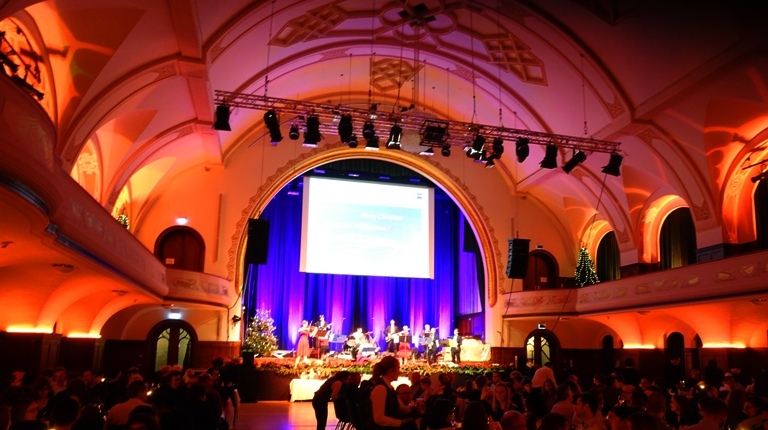 This entry was posted in Culture, Germany, Holidays, Memories, Travel and tagged Christmas Party, Holiday party, Jena, party food, Volkshaus, Zeiss Foundation. Bookmark the permalink.